This is the third post in a series about communicating with birth parents. You have been communicating through e-mail and maybe over the phone with a specific birth mother, and now it's time for the face to face meeting. This is a tremendous opportunity for all of you, and something that is really worth looking forward to. There are many different ways that a face-to-face meeting can take place today. The social worker may or may not be present. It might be at the adoption agency, or it might be at a restaurant or other public place. Be sure to let the birth parent(s) talk! Be certain you bring a camera! In an adoption triad, openness=honesty and vice versa. Don't try to hide things about yourself, people can usually tell when you're not being honest, and that doesn't help them trust you. Don't try to be someone you're not. You need to be a good match for each other based on who you really are, not who you think they want you to be. As I mentioned in an earlier post, many of these ideas come from a terrific social worker named Kevin Theriot. Where I say 'be united', he said, "Please don't argue with your spouse at the face to face meeting!" We all chuckled, but he told us that he has been floored by how often potential adoptive couples argue over little things in front of the birth parent(s) at this first meeting. Don't argue over what baby names you like, or whether or not you had agreed to adopt a child whose birth father used drugs, or whether or not to order dessert. (: Have all of the important discussions before you go in to the meeting, and leave the not so important ones for another time. Ask the birth parent(s) and their mothers if they're present, questions about themselves. Answer the questions they ask you, but let them do most of the talking. It has been shown that the more someone talks to you, the closer they feel to you. Don't interrupt or cut them off. Let a birth mother talk all she wants. If she's hesitant to talk, that's where you ask questions that don't just have a yes or no answer. I wish we would've brought a camera to the first face-to-face meeting with our daughter's birth mom. I know it seems like a no-brainer, but in the stress of trying to get there (especially if you're going out of town) you might forget. Thankfully, we have lots of wonderful pictures from the placement, and ongoing communication with lots of pictures now, but it would've been fun to have some pictures from that first day we met. So, when you go in for a face-to-face meeting, follow these be's, as well as one more. Be sure to follow your heart. It will be an amazing experience. Are you involved with an agency / case worker? What is the phone number where they can be reached? If they are not involved with a case worker or agency that you can call to verify their identity, I would suggest asking for something concrete to verify a pregnancy i.e. an ultrasound picture with the birth moms name on it. Don't freak out over this and don't be too pushy, but it is in everybody's best interest that you know there is an actual pregnancy going on. Gender, ethnicity, possible physical challenges, etc. How many other families are you e-mailing? Just so you know what stage of the game they're at. If they e-mailed 10 families, they're just getting started. If they e-mailed 2, they're getting serious about making a decision. Almost every adoption has some degree of legal risk. On a personal note, the adoptions of both of my two older children had some legal risk. With our daughter, it turned into a drawn out battle with the birth father that took 18 months to resolve. (Actually, once it finally made it to court, the judge threw it out and we were able to finalize, but it took that long to actually get to court.) With our son, the legal risk ended up NOT materializing into a problem, and there were no issues at all. So, I thought I'd share some great information that I learned at the National Families Supporting Adoption Conference about communicating with birth parents. Kevin Theriot is an amazing social worker and was the presenter for this workshop. Most of this information came from him, but I'm telling it in my own way. There is a lot of information that I wish someone would've told me when we first adopted our daughter almost ten years ago. You are ready to adopt a baby. You're either working on a home study, or have it completed. You are spreading the word about your desire to adopt, and you've set up an e-mail address designated to receive communications from potential birth parents. You log on one day, and discover an e-mail from a birth mom. You're ecstatic! Overjoyed! Exuberant! Before you get too carried away, there are a few things you should do (or not do). The first thing is actually a 'not do'. Do NOT assume that the birth parents have any information about your preferences for adopting. If you have any 'deal-breakers' (level of drug/alcohol abuse, specific gender, ethnic background, etc.) then you need to tactfully ASK about those things right up front. It's just mean to pursue a relationship and then have to tell the birth mom later on that you're not interested because you found out about one of these deal-breaker issues. Remember to be sensitive, but don't be afraid to ASK! The next thing is to BE HONEST! The birth parents will probably have asked you some questions. Answer them openly and honestly, whether you think it's what they want to hear or not. So, reply to that first e-mail and then wait patiently to hear back. If you do hear back, you should ask some screening questions to make sure that they are legitimate birth parents. It's rare, but unfortunately there are a few misguided people out there who try to scam hopeful adoptive couples. And those questions....will be covered in my next post. Until then, Happy Adoption Awareness Month! I'm SO excited to post the FINAL cover art for my novel, due out on February 8! Many thanks to Angela Olsen at Cedar Fort for her beautiful work! And since this book is all about infertility and adoption....it's a perfect fit for national adoption month! 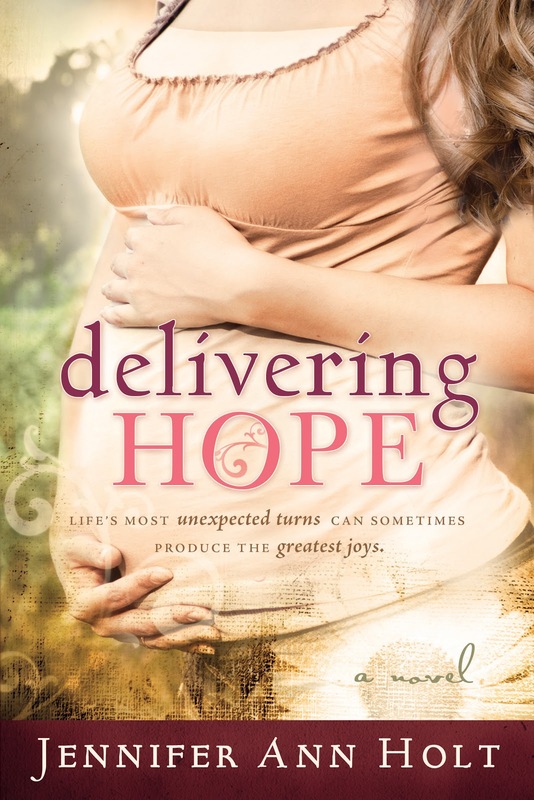 Check out the Delivering Hope tab on my blog for more info, or go to Amazon.com where you can pre-order your very own copy! I know, I know, it's been a while since I've posted. But, in my defense, I have been busily working on a sequel to my novel Delivering Hope. (: The sequel is buzzing along and I'm having fun uncovering 'the rest of the story' for the characters that I created and love. But, I couldn't let National Adoption Month pass without resuming my blogging. Check back throughout the month to read more about my adoption experiences...both the successful and the failed ones (and what I learned from them), as well as some tips about communicating with birth parents (these will mostly come from a wonderful social worker named Kevin Theriot whose workshop I attended at the National Families Supporting Adoption Conference) and any other fun or hopeful things I come up with. Have a wonderful day and check back soon!